Aspire Bifolds - Home Improvements Surrey | Bespoke Bifolding Doors and Home Improvements for Surrey and the Home Counties. Aspire are your trusted home improvement professionals, supplying and installing the finest quality home improvement products in aluminium and PVCu. Contact us today for the latest in quality bifolding doors, sliding doors and composite doors. Whether you are looking to replace your existing doors, are building a new extension or simply wish to make your home more secure and energy efficient, we can help. All our latest generation aluminium bifolding doors, contemporary sliding doors, and entrance doors are some of the best in the UK. From affordable home improvements to sophisticated aluminium systems, our entire range of products is specially selected for its quality, desirability and durability. With your design ideas and our expertise, we will transform your property into a fantastic living environment. Secure and thermally efficient aluminium windows. Discover our range of aluminium windows offering you a complete home solution. Aluminium windows provide everything for the energy efficient and secure home, allowing you to choose from the latest in contemporary or traditional windows. We even offer steel replacement aluminium windows and doors. Our range of PVCu windows offers you with the most cutting-edge windows on the market. At Aspire you will find the very latest in bespoke timber look PVCu windows, slimline contemporary PVCu and even authentic sliding sash windows. Contact us today to find out how Aspire Bifolds can create you the ultimate, aspirational home, at great prices and a 1st class personal service. An Aspire Glazed Extension, Conservatory or Orangery gives your home a vibrant, functional and feature rich space. Your first contact with our company will be with one of the Directors or Senior Managers. We believe the person you speak to should be and be able to answer your questions instantly. No other company offers our wide range of products. You deal directly with the Directors of the business. Honest, transparent pricing with no gimmicks or pressure selling. 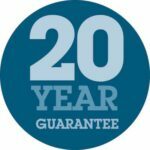 Products with up to 20 years guarantee.